Possibly the last things most people would imagine being counterfeited are food and drink. But it happens, and on a much wider scale than most people could possibly imagine. Take wines and spirits, for instance. They're a massive business, and very ripe for counterfeiting, which occurs all over the globe. 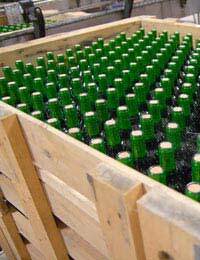 According to some estimates, around £9 million worth of counterfeit wine was sold in 2004 - and that's just wine. But it doesn't stop there. Everything can be faked, even tea bags - yes, that brew might not be the real thing. Instant coffee, Coca-Cola, baby food and milk powder are just a part of the vast range of food items that are counterfeited. Although greater vigilance on the EU borders has meant a sharp drop in the fakes getting into Europe, they're still here, although it's nowhere near as prevalent a problem as it is in developing countries. A few years ago it was discovered that counterfeit Johnnie Walker whisky had made its way into Britain and was being sold. The problem was that the drink contained methanol, a chemical with the potential to poison, and even cause blindness. If that seems extreme, it's not, although such things rarely happen in the UK. But that cheap bottle of Scotch from a man at the pub, or that case of cheap wine from someone you met - how do you really know what's in it? Fake drink and food can contain almost anything. There's simply no way, without a full analysis, of knowing. Those things could be poisonous. The counterfeiters have no scruples about that; they're only in the game to make money. They want to maximise profits, so they don't care what goes in as long as the taste approximates the real thing enough to fool people. Sorting the counterfeit from the real can sometimes be very difficult, at least without a detailed comparison of the products, especially the packaging and labels. In many instances you'd need to have the two side by side. In the case of the fake whisky, for example, unless you tasted it - and it did taste different, by all accounts - the only way of distinguishing it was by details on the label, which included a fake lot code, a missing neck label, some Spanish writing on the label, and a missing "E Mark." Those were all things that could have been missed at a quick glance, and typical of the way so many counterfeiters operate. Superficially they do a good job, but when checked more thoroughly, the differences begin to emerge. Don't ever rely on taste to tell the difference, though. Those ingredients could be deadly. If there are any doubts about an item, take it to Trading Standards, who can have it professionally examined - after all, if there's fake food and drink around, they definitely want to know. Beware, too, on wine auction sites, especially of the more expensive bottles. Take notice of the sellers and their reputations, or you could lose a lot of money to something counterfeit. Governments and industry are doing all they can to battle the problem, but it remains an uphill struggle. if the west is better at blocking bogus parts from getting attached to commercial airliners why doesn't the US Congress demand that all airliners operating in US airspace -- to, from, around the country - be maintained under the watch of FAA??? ?